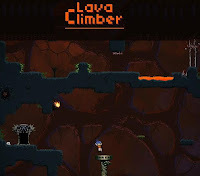 Lava Climber is a new retro platform adventure game from chman and fei. As the story say,the devil himself stole your girlfriend and sent you down to the bottom of the Earth, a place dominated by extremely hot lava, spikes and evil monkeys. Your general objective is to climb back through 18 challenging levels to the top where your girlfriend is held captive by the ugly devil. The game features a retro classic pixel style graphics complete with NES like sound effects and background music. It is played with left/right arrow keys for moving, down key to crouch and up to jump. Analysis: while the game as a whole can be so enjoyable due to its sheer retro awesomeness flavor, it can also be a bit frustrating because of its well placed hazards and the pressure of the rising lava. It's a great play nonetheless. Meanwhile, here is Lava Climber walkthrough for those who need it.